Hi again, this week I chipped away at some more progress on The Elementalist. Another level is done! This one is set high in the clouds, with a new enemy to boot. This level has made me reconsider a lot of design decisions taken earlier in the game. I've been doing a lot of playtesting with friends to try and work out what the difficulty should really be: too hard and the game becomes infuriating, too easy and there's no substantial challenge. The Elementalist will be sitting on the harder side of those difficulties, but I'll try to include options for those that want to experience the gameplay but can't cope with the default level of challenge. Anyways, what I discovered was that the game was simply and plainly too hard to begin with. 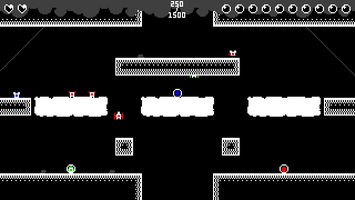 Each level has a score target which, when exceeded, deems the level to be complete. The first step I took was to lower these thresholds, but even after this tweak the game was too difficult. I had to keep making progress and developing new levels in parallel with alterations to earlier ones as otherwise I would not actually be getting closer to finishing the game, just making a more polished version of something that I couldn't actually release. 1) Enemies will not be collecting in just one place. The Elementalist is designed such that leaving one edge of the screen causes the player and the enemy reappear on the opposite side. However, some levels saw enemies just collect at the bottom of the screen in one big pile and this was quite boring. I made sure that every level has an exit on the top bottom and both sides so that this doesn't happen. 2) Health pickups ensure the player isn't left with no way to bounce back. Say you're almost at the score threshold but only have one heart left. It'd be immensely frustrating for a sudden bombardment to leave the player unable to survive. Hence, at certain thresholds, hearts now spawn in in the level, which the player can pick up to replenish their health. 3) More health! Most of the time the player can't survive the whole level. Going from 3 hearts to 5 mitigates this. 4) Different scores for different enemies. It felt kind of unfair that killing any enemy, regardless of how relatively hard it was to do so, always gave the player 50 points. Now, the harder the enemy is, the more points the player gets! Of course, even with these alterations, the Elementalist is still very difficult, and there needs to be a way to make it more accessible. The more options the player has the better, so before launch I'll be trying to make sure these are added. The Elementalist will be launching late in April! I've got a pretty secure date set out but I won't be announcing it until closer to the time just to be sure I can make it. Thanks for reading! If you're interested in receiving updates, follow me here on itch.io or over on Twitter. Check out the next blog post in a week!